This time around, we’re talking with Jonathan Blake Huer, Director of Emerging Technologies at Ball State University and author of Be Employed When You Graduate. He’s all about empowering students to find their own career success (and you can tell when you read his detailed Q&A!). Below he answers our questions and shares some of his career search advice for college students and recent grads. When should students start considering their career goals, and how should those goals color their college search and other academic choices? Students should start exploring career possibilities as soon as possible. The earlier you start, the more time you have to build the foundation for a career. But, you need to be open to the fact that you will learn and grow as a person and that your career objectives might change. There are obviously some practical considerations. On the extreme end, you need to start training when very young if you want to be a professional athlete or dancer. Even with far less extreme careers, it’s very expensive in both time and money if you need to drastically change your major your last semester of college to pursue your newly discovered dream job. What’s important is to find what decisions you’re comfortable with between a career you’re proud of and how much of your life you’re willing to sacrifice to pursue that career. Take the time to research your career options thoroughly. Talk to your parents. Talk to your friends’ parents. Talk to your professors and the professional staff at your school. Reach out through Greek life, clubs, and other organizations to get coffee or Skype with someone working in your field to ask some questions. Research and be prepared for the conversations. Get as many opinions as you can from people that you trust. Ask people what they like about their jobs. What don’t they like? What are the hours like? What is the work culture like? What does the future of their job look like? How will changing technology impact it? What sort of education is required? What’s are the entry-level positions like? And make sure that your only impression of a job isn’t from a TV show! Get an internship so you can see what it’s really like. Internships are valuable, even if all you find is that it’s a job you don’t want. Once you have explored your career options, start to make some goals. Where do you want to be in 10 years? In five years? Which major do you need to get that job? If you’re in high school, what colleges offer that major? Personally, I chose to go to a larger university (UCLA) so that I would have a wide range of majors available to me in case I changed my mind (which I did several times). I hadn’t even heard of my major (design) until I met a girl living on my floor who was in the major. If you’re a few years into your college career already, don’t worry. Just remember that there are many ways to gain skills today online. In most cases, having a degree is more important than having the right degree. What role does the college major have on the job search? Remember that broadly speaking, the objective of college is to get a degree, not a job. There are certain narrowly focused majors that lead directly into specific jobs, but they might also be too specific if you need to change careers later in life. There are other majors that provide a broad education, but leave it up to you to figure out how you’re going to use your degree. The relationship between majors and the job market is surprisingly complex as colleges create majors in response to industry specific requests and industry views certain majors as lacking in focus. Like most aspects of the job search, you have more control than you might initially feel. You just have to connect the dots between all the different facets of your life. Your college major is just one part of your history. What’s more important is how you choose to market yourself. How do all the various pieces of your life contribute to who you are? If you were a straight A student and at the top of your class, why did you do it? And what did you have to sacrifice? If you didn’t get the best of grades, what were you doing with that time and how do those skills and experiences make you a better candidate? And more importantly, how is all that going to contribute to the company you’re applying to work at? I think it’s important to separate out your college major from your skill set. A college degree is just one tool you have (although usually the most important one) to prove you are qualified to do a job. You as an applicant can prove you have certain skills through a degree, but also a portfolio, website, technical interview, industry standard certifications, or even LinkedIn endorsements. For example, if you’re an art major (generally considered a major with low employment), but you can write code (which is in overwhelming demand right now), you can craft yourself as a creative problem solver who can contribute to a computer program in greater ways that a traditionally trained developer. Obviously, there are some limits to these principles. But a greater concern to me is someone who changes majors repeatedly in pursuit of some “ideal” major and ends up being an undergrad for seven years. The Internet provides many opportunities to learn new skills. If nothing else, a degree proves you are capable of finishing something you start, which is a skill every employer values. What are your top tips for the job/internship search, application, and interviewing processes for those new to the task? My best advice is to meet people in person. Today, we rely on electronic communication so much, from e-mail to Twitter, that we think it will get the job done. Yes, it can be a great way to make some new contacts. But there is nothing like a face-to-face conversation. It’s a lot easier for a prospective employer to ignore a random e-mail request than it is to ignore someone you’ve had lunch with and clearly is making an earnest effort to get a job or internship. Electronic communication is great to meet people, but face-to-face will close the deal. Of course to feel comfortable face-to-face, you must practice! I am constantly amazed by how many people have seriously played a musical instrument or a sport and don’t translate those repetitive practice skills to networking and interviewing! Practice repeatedly with interview questions (you can search online and find plenty). Start by thinking about them while driving or walking. Just start to think about what you’ll say. Next, record yourself (your phone probably has the capability). It doesn’t have to be high quality, but a video recording or even a voice recording gives you solid evidence to watch. Pay attention to your body language and your answers. Do you ramble? Do you slouch? Yes, it will be painful to watch, but that’s how you can critique yourself and get better. Lastly, practice with a teacher, colleague, or friend. Work on giving clear, concise answers to the questions and learning to pivot from whatever question you receive to talking about something that you really want to share about yourself. For your application, there’s not much I can say other than to be complete and error free. Too many applications get stopped in an HR department because an applicant forgot to answer a required question or include a requested document. In a competitive job market, spelling errors and incomplete applications just make it easier to narrow the candidates. Don’t give someone an easy reason to ignore your application! How might students and graduates reflect upon their previous work or other extracurricular experiences to inform future career choices? I always advise students—particularly freshmen—to spend some time alone with their thoughts. For many people, college provides a disconnect from parents and the past for the first time ever. You need to analyze your life and make sure that you’re doing things for you, not doing things to please others or because it was convenient. You may have been very involved in a sport because it was the thing your friends did. Or you might start out with a particular major because it’s something a guidance counselor recommended. I think it’s a good idea to have a plan, but it’s always ok to change it. It’s your life, so find a balance between short-term and long-term happiness. What’s most difficult but important is figuring out why you liked something. Studies show that having colleagues you enjoy leads to greater job satisfaction than the job itself. It’s important to separate out these things in your mind. You might find greater long-term satisfaction at a job that is less exciting, but one that you’re naturally good at and is therefore easier for you. This might free up more time for other things in life such as hobbies or raising a family. Conversely, you might enjoy a job that is less exciting, but in a sector for which you have a passion. Remember, even pro sports teams have accountants! What’s important is that you figure out what’s right for you. What are some trends you’re seeing in entry-level employment? In job search attitudes and best practices? In my office, I work with a variety of students from aspiring filmmakers to app developers. So I see an interesting range of struggles between students applying for jobs in a very competitive industry and one where the demand far exceeds the supply. Surprisingly, all students seem to have similar experiences. The main difference is in starting salary. Employers want the best candidate they can get and students want the best job they can get. So both sides are hesitant to commit until they are sure. 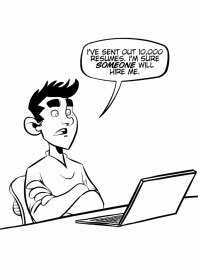 I think that the biggest mistake students make is sending out a ton of résumés and expecting that to be enough (that’s where the accompanying cartoon from my book comes from). The Internet makes that very simple to do now. I think that’s a waste of time on both sides. It’s a lot more effective to be more focused and court your prospective job. Make contacts there. Find out more about the company. Get to know a few people. Make sure that it’s truly where you want to work. Get an internship. Then be prepared, wait for your opportunity, and go after that job. How would you advise students best position themselves to be employed when they graduate? There are many job skills that can be acquired in any job, from simply interacting with people to dragging yourself out of bed in the morning on time! So the best advice I have is to get started with something. Anything! If you can’t find a starting job, then volunteer. Always be looking for opportunities to connect your basic skills to more advanced opportunities and to then connect those to an entry-level job in your dream field. If you connect your past experiences to the job for which you’re applying, then you’re already more prepared than if you do nothing. In Be Employed When You Graduate, I lay this out so that each year builds to a new goal, starting with an on campus job and eventually ending in an entry-level job in your desired field. The earlier you start, the better! Want to learn more about Mr. Huer and his career search advice for college students and recent grads? You can visit his personal website or the site for his book, Be Employed When You Graduate. You can even check out an excerpt here!